During the summertime our public pool is packed, so I swim very early in the morning. It’s 7AM and I’m already half way through my one-mile swim. I am on my back looking at the clouds and trying to avoid the burning sun. It’s shining and blinding me as if I’m sitting in a police station and someone trying to examine me using questionable methods. Then I notice the swarm of birds, at least a dozen of them. They circle up high over the pool, and then they come lower and lower. They are tiny, and they fly so fast. I see a sparkle of blue, but it’s the split tail that gives them away. Swallows. They say that one swallow doesn’t make a summer, well, that seems to be right. 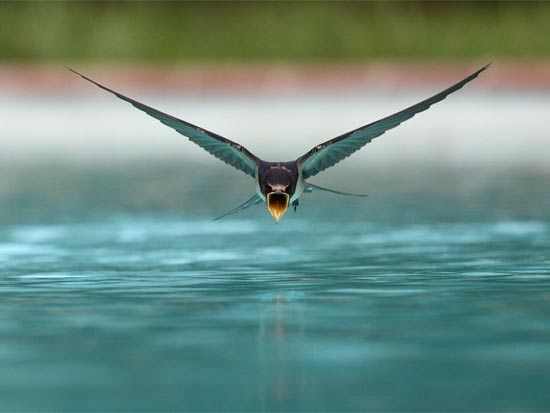 Then, one of them flies so low she opens her beak and scoops a drop of chlorinated water. The rest of the flock keep their distance, but it’s obvious that they are keeping an eye, watching her. Then another one drinks, and another. I stop at the shallow water. I came for a morning swim, and I found myself on a spectacular show. My smile is so wide that my cheeks ache, but I can’t stop smiling. It’s so beautiful. None of the other swimmers seem to notice. They continue to swim back and forth. The lifeguard seems to be sleeping behind his shades. I can’t believe they are missing it, but then I realize – The swallows are like the gorilla in the room. So unexpected that no one sees it.